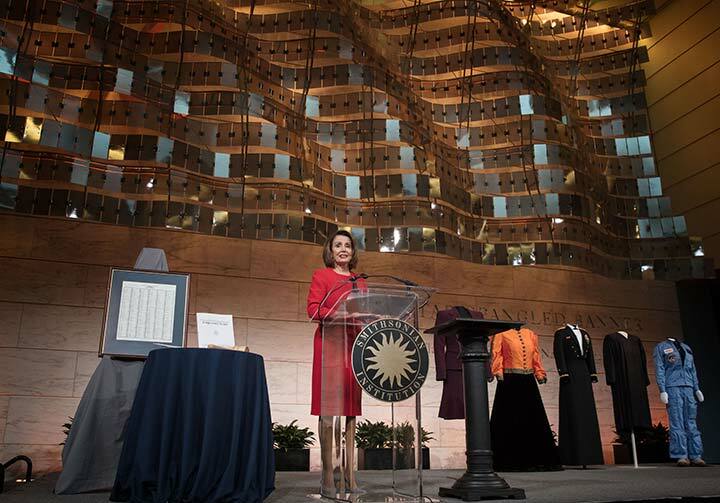 Nancy Pelosi, the Democratic leader of the U.S. House of Representatives, presented the Smithsonian’s National Museum of American History with historic objects related to the Jan. 4, 2007, ceremony during which she was sworn in as the 52nd Speaker of the House—the first woman to hold that office. This donation is the first in an expanded effort to document women in American politics. Pelosi’s donation enhances the growing collection of artifacts highlighting the role of women in American history. The collection includes objects representing other important women’s “firsts”—Sally Ride’s space suit, from the National Air and Space Museum; Marian Anderson’s ensemble worn for her 1939 concert at the Lincoln Memorial, from the National Museum of African American History and Culture; and Sandra Day O’Connor’s Supreme Court robe and a uniform worn by Brig. Gen. Anna Mae Hays, chief of the Army Nurse Corps, both from the National Museum of American History. These objects were on display in Flag Hall during the ceremony. In addition to the wooden gavel she received that day, Pelosi donated the burgundy suit she wore and the original copy of the speech she gave that morning. “Gavels are icons of power and authority, and in politics, the power they symbolize is both ceremonial and real,” said Lisa Kathleen Graddy, curator of political history at the National Museum of American History. The artifacts will join the museum’s political history collection. There are no immediate plans to display them. Other gavels in the collection include those used by former Speakers of the House, by the first women to chair the Republican and Democratic Presidential nominating conventions and by Susan B. Anthony, who wielded power, authority and gavels long before women held national elected office. Other speakers at the ceremony included House Republican Conference Chair Cathy McMorris Rodgers (R-Wash.), Rep. Doris Matsui (D-Calif.) and Judy Woodruff, anchor and managing editor of PBS NewsHour. During the event in the museum’s Flag Hall, Smithsonian Secretary David Skorton introduced the planning phase for the Smithsonian American Women’s History Initiative, which will highlight women’s contributions and accomplishments. “Women’s history is American history,” Skorton said. “With this initiative, we at the Smithsonian are fully committed to amplifying the voices of women and sharing their remarkable contributions to the history of the United States with the world. We are now in the planning phase for the initiative, gathering input for this important effort.” An announcement of the details of the initiative is planned for later this year. Pelosi served as the 52nd Speaker of the House until 2011. As Speaker, she attained the highest rank of any female politician in American history. Politics runs in Pelosi’s family; her father and brother served as mayor of her hometown, Baltimore. Her political career began when she became a representative for the 8th Congressional District of California, which includes San Francisco. Since then, she has served on the Appropriations Committee and the Permanent Select Committee on Intelligence and became the first woman to serve as the Democratic leader of the House and then Speaker. In her speech the day she became Madam Speaker, Pelosi discussed the historical importance of being the first woman to hold the position of Speaker.